Oklahoma City, Okla. – October 14, 2015 –The first ETF to exclusively hold shares of public companies that are engaged in the research and development of therapies that treat cancer through the body’s immune system will begin trading on the NASDAQ this morning. The Loncar Cancer Immunotherapy ETF (CNCR) is based on the Loncar Cancer Immunotherapy Index, an innovative index developed by biotechnology investor Brad Loncar, and has an expense ratio of 0.79 percent. Exchange Traded Concepts, LLC (ETC) partnered with Loncar Investments, ISE ETF Ventures, and Amplify Development LLC on the successful launch. The ETF includes both large pharmaceutical and growth-oriented biotechnology companies that are leading this disruptive approach to cancer treatment. Bristol-Myers Squibb (4.15% index weighting, ticker: BMY), Merck (3.89% index weighting, ticker: MRK), Juno Therapeutics (3.53% index weighting, ticker: JUNO) and Cellectis (2.98% index weighting, ticker: CLLS) are four of the index’s thirty holdings. Twenty-three of the holdings are growth companies, while the remaining seven are large-cap, value equities. Why immunotherapy: Cancer immunotherapy is an important sector in biotechnology that is changing the way many cancers are treated. While traditional medicines like chemotherapies often give cancer a broad punch, the benefit of using immunotherapy is derived from the immune system’s dynamic nature and the way it can more precisely be tailored to fight the disease. Some immunotherapies have exhibited uncommon results in clinical trials including partial and complete responses in late stage cancer patients. About Exchange Traded Concepts: ETC is carving out a niche as a portal to launch new, custom exchange-traded funds efficiently and cost-effectively through a complete turnkey solution. ETC is a private-label exchange-traded funds advisor with passive and active exemptive relief from the Securities and Exchange Commission (SEC) to launch both domestic and international equity exchange traded ETFs under the Investment Company Act of 1940. For more information, please go to www.exchangetradedconcepts.com. About Loncar Investments: Loncar Investments, LLC, the provider of the Loncar Immunotherapy Index index, is committed to making the biotechnology space more approachable to a wider range of investors. The company is principally owned by biotech investor Brad Loncar. Mr. Loncar manages a biotech-focused family portfolio from his Lenexa, Kansas office. He can be followed on Twitter at @bradloncar and his commentary is available at www.loncarblog.com. About ISE ETF Ventures: ISE ETF Ventures partners with issuers to launch exchange traded products (ETPs) such as exchange traded ETFs (ETFs), exchange traded notes (ETNs) and other similar product types. They also provide capital for the start-up and ongoing backstopping of new ETPs. Partners are able to leverage ISE ETF Ventures’ global experience and broad network of industry participants in order to grow their ETP presence and increase product issuance. Total assets under management for ETPs tied to ISE ETF Ventures indexes is approximately $3 billion. ISE ETF Ventures is operated by ISE Holdings, which is a member of Eurex Group, and together they operate one of the largest transatlantic derivatives marketplaces. Eurex Group is owned by Deutsche Börse AG (Xetra: DB1). About Amplify Development LLC: Amplify Development LLC is led by fund industry veteran Christian Magoon and partners in the development and support of compelling third party funds. The firm is an affiliate of Amplify Investments LLC, an ETF Sponsor. 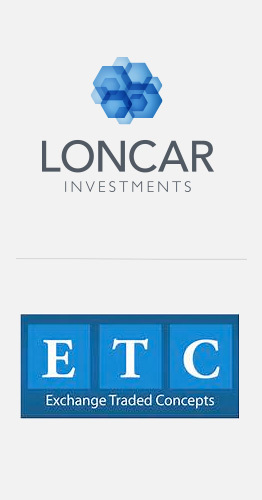 Opinions expressed are those of ETC, Loncar Investments and their partners and are subject to change, not guaranteed, and should not be considered investment advice. Investing involves risk; Principal loss is possible. The fund will invest in immunotherapy companies which are highly dependent on the development, procurement and marketing of drugs and the protection and exploitation of intellectual property rights. A company’s valuation can also be greatly affected if one of its products is proven or alleged to be unsafe, ineffective or unprofitable. The costs associated with developing new drugs can be significant, and the results are unpredictable. The process for obtaining regulatory approval by the U.S. Food and Drug Administration or other governmental regulatory authorities is long and costly and there can be no assurance that the necessary approvals with be obtained and maintained. The fund may invest in foreign securities, which involve political, economic, currency risk, greater volatility, and differences in accounting methods. The fund is non-diversified meaning it may concentrate its assets in fewer individual holdings than a diversified fund. Therefore, the fund is more exposed to individual stock volatility than a diversified fund. The fund invests in smaller companies which may have more limited liquidity and greater volatility compared to larger companies. The fund is not actively managed and may be affected by a general decline in market segments related to the index. The fund invests in securities included in, or representative of securities included in, the index, regardless of their investment merits. The performance of the fund may diverge from that of the Index and may experience tracking error to a greater extent than a fund that seeks to replicate an index. The fund’s investment objectives, risks, charges and expenses must be considered carefully before investing. The summary and statutory prospectuses contain this and other important information about the investment company, and may be obtained by calling 800.617.0004 or visiting www.loncarETFs.com. Read it carefully before investing. ETF holdings are subject to change and should not be considered a recommendation to buy or sell any security. The % of assets held in the index and disclosed in this material is as of 10/7/2015. The fund, once launched, seeks to replicate the % of holdings in the underlying index. The NASDAQ Composite Index is a market capitalization-weighted index that is designed to represent the performance of the National Market System which includes over 5,000 stocks traded only over-the-counter and not on an exchange. One cannot invest directly in an index. The SEC does not approve or disapprove of any investment. (www.sec.gov). The Loncar Cancer Immunotherapy fund is distributed by Quasar Distributors, LLC.